Join us in the Mexican West for a swashbuckling, romance packed night of laughs. "Zorro!" Like you've never seen it before. 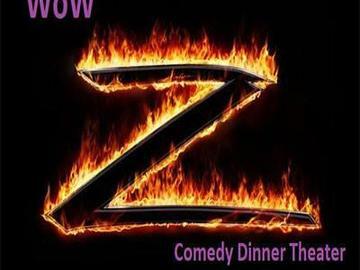 An interactive comedy dinner theater, presented by Salty Dinner Theater. Can Zorro save the beautiful Katerina from the villainous Governor's evil plot? Does Katerina even NEED saving? Find out on March 29, 7:30 p.m. to 10 p.m., at Heritage Gardens in Sandy, Utah. Zorro, the world's first superhero! For $30 per person, participants spend an enjoyable evening eating a savory taco bar and witnessing a live-action storytelling experience with a dramatic, comedic flare. Some audience members may have the distinct opportunity to join in the fun with singing and playful competitions. There's music, laughter and a lock-up for those WANTED! Much like the MDA Lock-Up, citations purchased by participants for $25 require a bailout for the “arrested.” Some of the lucky participants may receive a "Get Out Of Jail FREE" card but others may just have to pass the sombrero around for donations to be let loose. It’s all in fun! And that's not all! There are items for bid in a silent auction that includes gift baskets, a tandem skydive in Moab, and even Jet Blue tickets to anywhere the airline flies. All the money raised goes 100% to support the mentoring services that assist women to transform their lives out of abuse, addiction, forced polygamy, and debilitating illness. Tickets are $30 per person which includes a silent auction, and a delicious dinner with dessert and entertainment provided by Salty Dinner Theater. Please get your tickets today, as seating is limited! Credit cards are accepted at the event for the silent auction and "citations." We encourage you to dress in costume! Event is open to 14 years and older.